Henry’s kingdom is under assault from two sides: on one, a band of restless rebels, the same Percy family that helped set him on the throne, now led against him by the Earl of Worcester (Kimberly Scott) and her temperamental, talented niece Hotspur (Alejandra Escalante), a young soldier held in high respect by all. On the other, there’s Henry’s own son, Prince Hal, who spends his days drinking and stealing in the company of the amoral but magnetic Sir John Falstaff (G. Valmont Thomas), undermining confidence in his fitness to someday rule. Hotspur is rhapsodized repeatedly as the shining light of England, and Escalante’s rendition is the guiding spark of Part One. By casting Hotspur as a woman, director Lileana Blain-Cruz reshapes the now-accepted understanding of Hotspur as idealistic but fatally flawed; an inspiring banner to fight under, but a man who should never be king. Escalante’s blunt, hair-trigger Hotspur feels at times like a bird battering against the bars of a cage: she can’t understand why everyone around keeps trying to enclose her with such pointless standards of behavior. Rules and manners cannot contain her, and she doesn’t see why they should. 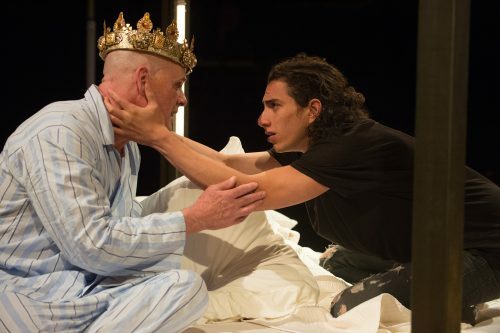 She has come so far just as herself– and to make her a woman, to make her openly queer, to cast the role with a Latina actor provides a constant reminder of just how far that must have been, and adds new shades to King Henry’s envious scorn. Prince Hal, on the other hand, knows exactly what people expect him to be, and willfully defies that expectation. Daniel José Molina’s Hal, through his drug-fueled haze, is without Machiavellian malice and plainly good at heart: it soon becomes clear that his rebellion is more like a preemptive strike against his father’s unavoidable disappointment with his heir, who lacks his father’s ruthless focus. Part One asks how these rebellious parties can be brought under control; Part Two (directed by Carl Cofield) wonders whether such a tenuous peace can be sustained. The rebels of Part Two are less vividly drawn, but the cast of the court expands and grows more fractious. Characters like Robin Goodrin Nordli’s prim Lord Chief Justice on one side and Falstaff’s expanding band of rogues on the other provide the thematic poles for this play, repeatedly begging the question of which side Hal will choose when he’s made king – and thus, what England itself will become. It’s far more fractured than the first part, less propulsive and less linear by design. If you find yourself wondering where it’s going—well, the characters are wondering that, too. What is their country going to be? 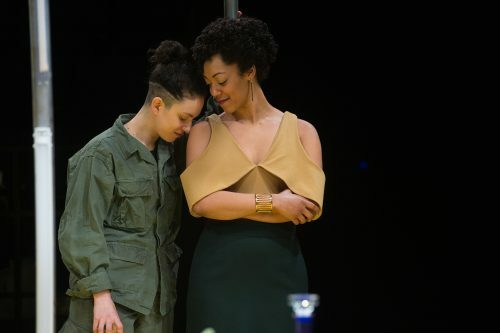 The play climaxes with scenes that exemplify Shakespeare’s skillful straddling of history and tragedy, and they are well carried out by Molina, King, and (on as the understudy for G. Valmont Thomas the afternoon I saw it) Tyrone Wilson. It leaves the door wide open for the play to come: Hal’s triumph in Henry V.
So where does The Merry Wives of Windsor fit in? That’s a question without a complete answer. There’s a popular story that Queen Elizabeth herself asked for another play about Falstaff, and wanted to see him falling in love, but that’s almost certainly not true. What does seem to be true is that The Merry Wives of Windsor was written to capitalize on Falstaff’s popularity, though it’s not certain whether that was in between the two parts of Henry IV, or between those and Henry V.
Dawn Monique Williams’ production, set in the Allen Elizabethan Theater in a fun 1980s/1600s fusion (fantastic costumes by Ulises Alcala) and studded with favorite ’80s hits sung by the ensemble, manages to argue that this very frothy, unfinished-feeling comedy (several plot threads get dropped without explanation, among other things) is perhaps unfairly maligned. At least, it’s certainly no stupider than The Comedy of Errors or The Taming of the Shrew. And unlike the latter, inexplicably popular comedy, The Merry Wives of Windsor is about self-assured, witty women taking their destinies into their own hands. And middle-aged ones, no less. When the lecherous knight Falstaff comes to town (played as a man with a giant codpiece by the impeccable K.T. Vogt) and decides to seduce the married Mistress Page (Vilma Silva, consistently one of the brightest actors in the whole company) and Mistress Ford (Amy Newman), the ladies decide to respond to his presumptuous courtship by trapping him in a series of humiliating situations. Meanwhile, Mistress Page and her husband (Paul Juhn) separately plot to marry off their daughter Anne (Jamie Ann Romero) to two different men. Master Ford favors Slender, a foolish young fop who does not particularly want to marry Anne (or, as played by Cristofer Jean, any woman). Mistress Page is gunning for Dr. Caius, a French physician armed with an outrageous French accent and red silk outfit. Though he, unsurprisingly, does not run away with the girl, Jeremy Peter Johnson does nearly run away with the show in the company of Sara Bruner as Sir Hugh Evans, the good-natured but pedantic Welsh parson who Dr. Caius attempts to duel. Meanwhile, Anne yearns for the young, handsome Fenton (who her parents dislike because he is, in another fun cross-play reference, a friend of the reckless Prince Hal). Meanwhile, Mistress Ford’s irrationally jealous husband (Rex Young) goes in disguise to Falstaff to try and find out whether his long-held suspicions about Mistress Ford’s fidelity are finally justified. You might be starting to see why a comedy that’s simultaneously so convoluted and so shallow is not really a go-to. It’s easy to get overwhelmed by all the people and plots, especially considering that most people are not familiar with the play going in. 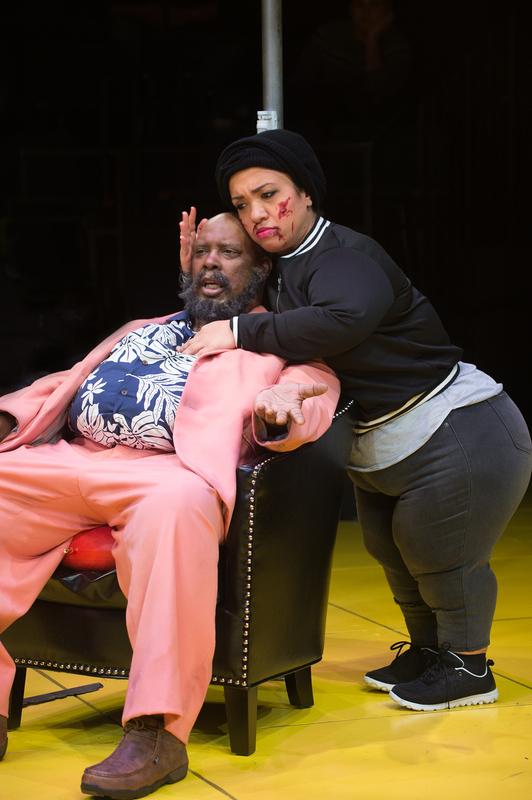 But Williams’ technicolor ’80s vibe, especially the giddy musical numbers, nimbly projects a sense of comfort, guiding a path through Shakespeare’s scattered storytelling paved with familiar music. Just sit back, have fun, watch it all fall apart, and rest assured that it will all come back together again. The fractured communities of Julius Caesar, however, are not so easily mended. The play made headlines when Shakespeare in the Park dressed the titular character as Donald Trump, but in OSF’s Angus Bowmer Theater, Shana Cooper takes a subtler tack. Without such an eye-catching parallel drawing attention to Caesar, Brutus emerges as the real center of the play, portrayed with soulful torment by Danforth Comins. His Brutus is both soldier and scholar: he first appears looking positively professorial in a tidy cardigan, but when the hour comes, he applies the ritualistic war paint worn with grim determination by all the soldiers in Cooper’s Rome. Unlike Rodney Gardiner’s spiky Cassius and Stephen Michael Spencer’s fiery Caska, Brutus resists conflict as long as he can. But while they may be too hasty, he may be too blind to the schisms riving the country well before he and the other assassins raise their knives to Caesar, before the country divides into outright war between the conspirators and Caesar’s loyalists, led by his adopted son Octavius Caesar (Benjamin Bonenfant) and his former right-hand man Mark Antony (Jordan Barbour). In its image of a country on the brink of civil war, Julius Caesar is a natural match for the Henry IV plays. But despite sharing political complexity and a modern-day aesthetic, Cooper mines the richer and stranger corners of this Roman tragedy to create a very different atmosphere than in either Henry IV. She never loses track of the text’s obsessive interest in fate, an element that is strangely frequently forgotten, considering that one of the play’s most famous moments is its opening prophecy: Beware the Ides of March. Did the quarrelsome, self-interested senators of Rome create the dark, supernatural forces inexorably propelling them to their doom, or have the workings of fate set them on this path to inescapable conflict against their will? The production offers no answers, but rather a useful reminder that the play is not inherently the pointed political drama its current reputation suggests it to be. Julius Caesar, named for a character who dies in Act Three, is concerned with people working out their relationships and duties to their country, but above that, to one another; with the reading and misreading of prophesies; with the question of what really leads a person to destruction: their stars, or their selves. So there’s another connecting thread: From Hotspur’s fury to Henry’s guilt to Falstaff’s indolence to Ford’s jealousy to Brutus and Cassius’s different shades of pride, these are plays whose characters bear the seeds of their own destructions. Some downfalls are more catastrophic than others; some communities are reaffirmed, some irreparably torn. None are any more or less than the flawed and messy individuals who make them up, all striving to figure out just who and what and where they are. Henry IV, Part One continues in repertory through Oct. 28 in the Thomas Theatre. Henry IV, Part Two continues in repertory through Oct. 29 in the Thomas Theatre. 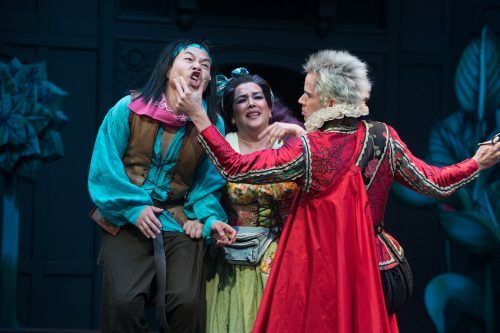 The Merry Wives of Windsor continues through Oct. 13 in the Allen Elizabethan Theatre. 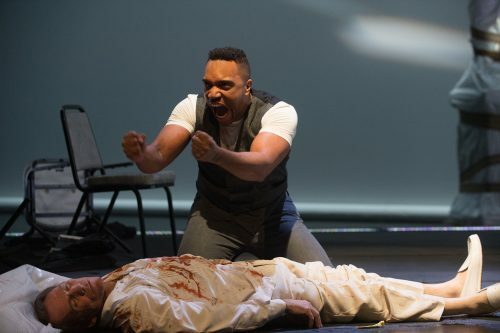 Julius Caesar continues in repertory through Oct. 29 in the Angus Bowmer Theatre. Bardolf is tied with Margaret with four appearances. He is in Henry IV p1 and p2, Merry Wives, and Henry V. An interesting tidbit of trivia: Rudolf the Rednosed Reindeer was indirectly inspired by Bardolf the red-nosed drunk. Well, leave it to Bardolf to upset our arithmetical applecart. Of course, as you suggest, sometimes Bardolf sees double, and what does THAT do to the count?